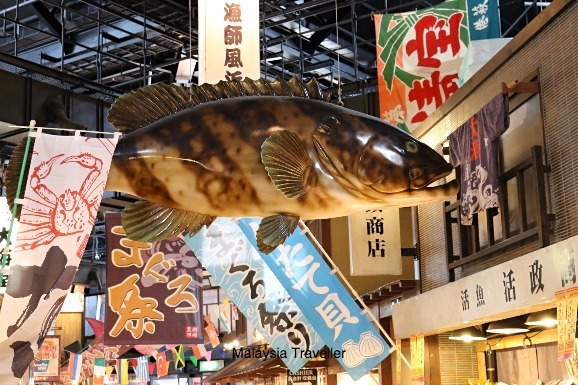 Kuroshio Ichiba Market is a fun place to shop for seafood, see a tuna filleting show and sample a variety of raw or grilled fish and other delicacies. 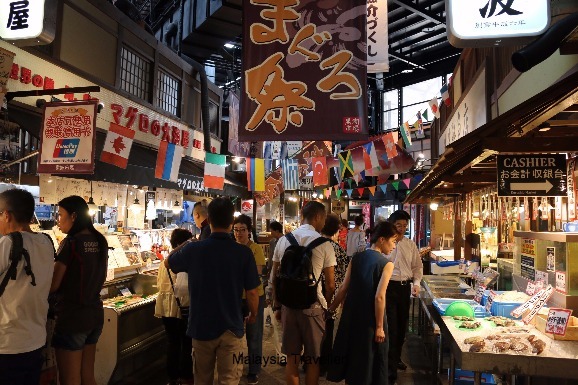 The market is housed in a modern purpose built structure but its darkened interior, colourful banners and vintage shop fronts evoke the atmosphere of old Edo period Japan. 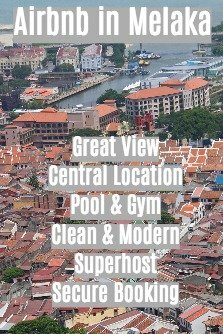 Here is my short video slide show to give you an idea. 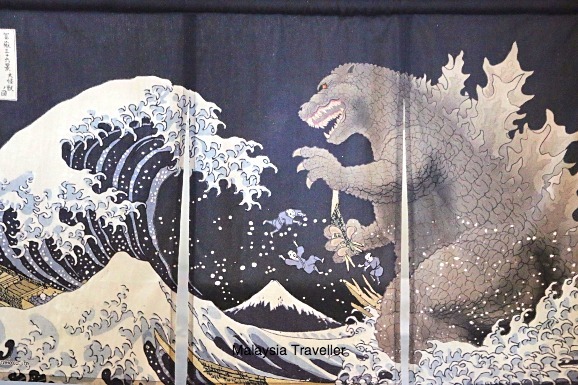 It is very much intended as a tourist attraction rather than a genuine local market but the produce sold appears to be top notch and the prices are reasonable by Japanese standards. Most of the tourists on the day of my visit were Chinese and Koreans in large coach-tour groups. While you can shop for fresh and dried seafood products to take away, most visitors buy ingredients for eating on the spot. 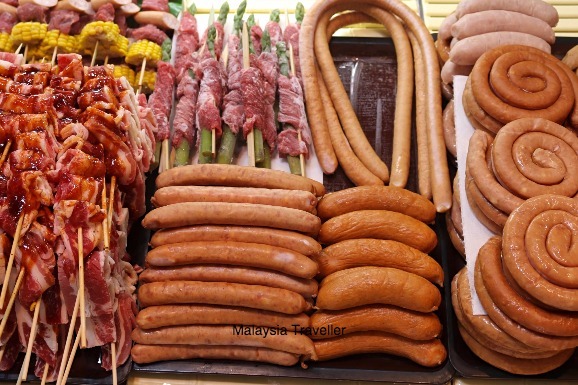 You can buy raw seafood, meat and vegetables and have them grilled or otherwise cooked according to your wishes. 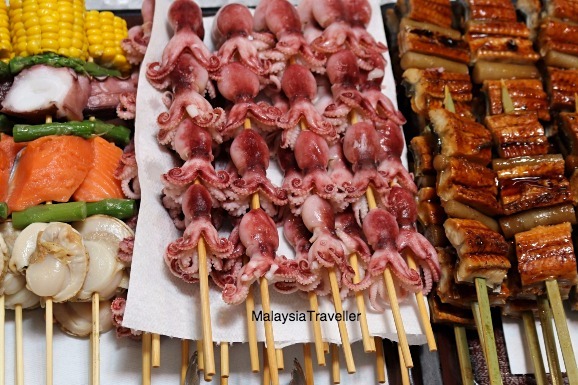 There is a vast array of food to choose including baby octopus, eel, squid, sushi, sashimi, prawns, shrimps, scallops, oysters, mussels, whelks, crab, salmon, snapper, sausages, beef, pork, chicken, sweet corn and more. You can buy ready prepared skewers of scallop, octopus, salmon and sweet corn for popping onto the BBQ grill. There is a large covered seating area outside the market where you can eat and have the food cooked and buy drinks and desserts. One of the highlights of the market is the tuna filleting demonstration where a master chef takes a whole tuna and shows how he skilfully slices and dices it in a matter of minutes. There is no nearby railway station. We took the Marina City bus from in front of JR Wakayama station.It took about 40 minutes and cost ¥510. Open daily from 10 am to 5 pm or 6 pm depending on the season. Check the official website for actual closing and holiday dates. The tuna cutting demos are held three times a day at 11 am,12.30 pm and 3 pm. Next to the market is the Kino-kuni Fruit Village selling a wide range of fresh and packaged fruit and vegetable products, locally made ice cream and healthy tofu dishes. Porto Europa, a Mediterranean-themed amusement park, is right next to the market. There is also an onsen here.